Inspired by a love to travel and a desire to understand other cultures, the creative designs of Jamie Young are sure to impress anyone! Her wonderful eclectic designs go from traditional, transitional to trend forward, constantly pushing the envelope with new materials, new designs and new categories for living everyday in style. 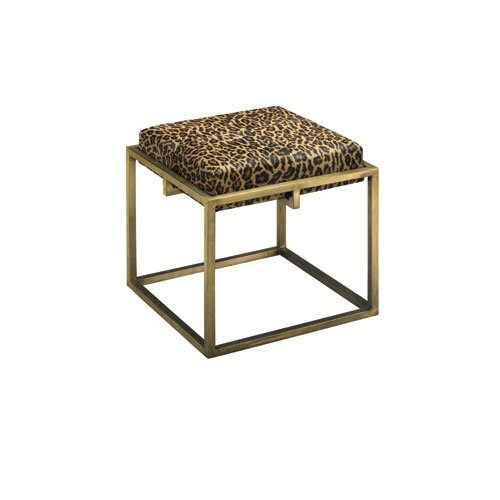 – Made using an antique brass metal base topped with a leather or hide cushion, the simple, clean lines of the Shelby Stools make them incredibly versatile. Use a pair at the end of a bed, in a living room, entry hall or where ever you need to take a seat! – Fully assembled – Foam seat cushion – Seat Height: 17-Inches – Seat Measures 18×18-Inches.